A few questions popped up on Ask Chaviva Anything, and I wanted to answer them quickly (because they have quick answers, believe it or not). There are lots sitting in the queue that I promise to get to over Chol ha'Moed (those are the intermediate days of the holiday Passover, which starts Monday night). Your decision to live in a settlement could be interpreted by some as being quite a controversial move and indicating a clear political statement in regards to the West Bank / Yehuda VeShomron region. Has your decision to move to Neve Daniel, particularly as a convert who seems to have enjoyed a very good quality of life when living in the United States, drawn criticism from others? I would imagine that your family and friends back home would have worried for your safety, given such incidents of violence against Jews as the Fogel massacre. However, I would be interested to know if you have ever felt the need to justify your decision to those who disagreed with settlements? Perhaps as a European I'm coming at this from a different angle, as I've seen firsthand how contentious the whole issue can be. Americans, from my own experiences, seem much more likely to see the settlements in a positive light. I hope my tone isn't accusatory and haven't included my own view on settlements because I don't feel that they're relevant to the question. As a fellow convert I've really enjoyed your blogs and insights into Judaism and while our views differ on some issues, I really admire your courage in documenting your life in such a public and honest way. I'd like to say this is an original question, but I've been asked it before and I wrote about it fairly recently. I hope it's not dismissive, and if there's anything I don't address in the blog post or comments, feel free to shoot me an email or comment on the blog post. But you can find my response to these kinds of queries in A Life Illegal. I like Question Numero ... um ... Three (wait, is it Tres). Bravo for inquiring. So now that you're a stepmom, are you now going to start writing for Kveller? This is a great question. I honestly hadn't even thought of it, but I suppose I should look into it, eh? Any one have any experience with Kveller or the process? Any bits of advice? Okay, that's all for now. There is packing in my future ... packing for England, where it's in the 30s and 40s (that's Fahrenheit, because -- let's be honest -- I'm never going to get on the Celsius bandwagon). I'm stoked to get back a little bit of the winter that I missed. Stay tuned for UK adventures! If there's one thing in Israel that I still haven't latched on to like a mosquito on fresh, pale skin, it's the entire concept of "tremping." For the uninformed, tremping is when you stand by the side of the road, stick out your finger or hand or hold up a sign saying where you need to go, and hitch a ride with a perfect stranger to your destination. It's basically hitch-hiking, but much safer. Sort of. My dad used to tell me about how he'd pick up hitchhikers in the 1970s, but nowadays in the U.S. it's highly illegal and incredibly dangerous to do so. In Israel, however, it's normal. In fact, some people get around solely by tremping, never needing a bus ticket or to buy gas for the car. When I first moved to Neve Daniel, tremping became a necessary reality. Yes, Mr. T and his business partner have two vehicles, but most of the time they're needed on the job site (and one of them is manual, which I just don't do). Every now and again, I wander up to the entrance of Neve Daniel and stand, somewhere between the tremping bench and the bus stop, hoping and praying that the bus comes soon so I don't have to tremp. Why? I'm a scaredy cat, that's why. I've tremped roughly a half-dozen times, and during all of them I've been perplexed. Do I tell them where I'm going? Where I need to get off? Do I just sit here? Do I say something? Do I offer a tip? WHAT DO I DO!? Today, for example, I was at home and realized that the construction going on in my building was going to push me off the ledge for the umpteenth day in a row. The floor was vibrating, my head was banging, and I needed to get out. I packed my things and headed to the trempiada (the fun word for where people stand to catch a tremp). 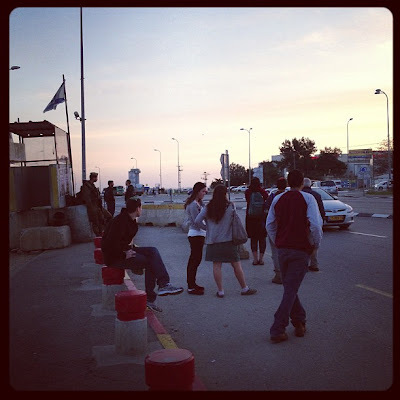 A few other women joined me there, and eventually a car came along heading to Tzomet HaGush, the central spot in the Gush where there's a grocery store, some restaurants, an electronics store, and so on. It's also a place where all of the buses in and out of the Gush always stop, and it's home to a gigantic trempiada. So I tremped to Tzomet HaGush and then walked over to the trempiada and hitched a ride into Jerusalem. Backwards way of doing things? Probably, but guess who was fresh out of cash for the bus? This chick! Now here's the thing. The guy said he was going into Mercaz ha'Ir (center of the city), which can mean a lot of different things. So what did I do? I just stayed in the car. We kept passing places where I could have gotten off, but me not being sure how to say "Dude, let me out here, please," decided to just ride along. This guy could have driven to Taiwan and I would have sat there quietly like a nice, Midwesterner. Luckily, he was traveling to a place where I could hitch a bus back to where I needed to be that we drove past. My carbon footprint was big on this one, and I feel bad, but seriously, I don't know how to get out of a tremp unless the other trempers say "I need out here." So that was the impetus for me to get out of the car -- someone else needing out. I haven't learned all of the hand signs yet, but I've learned that they're largely irrelevant these days. People pull over, roll down a window, announce where they're going, and people either get in the car or they don't. It's a fairly efficient system, if you ask me. The question is: When I'm driving, do I pull over and pick up trempers? When I'm alone, it feels really weird and unsafe to me. You can tell the girl out of Nebraska, but you can't take Nebraska out of the girl. The one time I did stop, no one needed a ride, and the only time anyone has ever gotten into the car was when I pulled in to Neve Daniel and gave a guy a ride up the gigantically ginormous hill. Either way, tremping is something that I feel like I'll never be good at. I don't have the chutzpah or patience or ... whatever it takes ... to be a skilled tremper. Is it just me (and the U.S. at that), or is hitchhiking a thing of the past? Is it common in Europe? Asia? South America? Is anyone interested in me hosting a LIVE Google+ Hangout (oh I'm not a big fan of G+, but it's the easiest way to do these things) to ask questions, watch me tie a tichel, and other fun things? It would be embedded here, available live on YouTube, or in G+. If you're not sure what a G+ Hangout is, watch this short, cute video. I was really excited after a pretty craptastic day to make pizza for Mr. T, because we'd been lamenting for days (if not weeks) about how there's no place in the Gush where I can purchase pizza that's gluten free (there is a pizza place, but, come on, it's kosher pizza, which means it's extra greasy and chock full o' gluten!). Then I came to find out he went out for lunch in Beitar at one of these said greasy pizza joints. Major planning fail! Luckily, with my mad cooking skills in tow, I managed to blow that pizza out of the water, redeeming the pizza cravings that have plagued us for so long. I have to say that I'm incredibly blessed to have a husband who is down with gluten-free eating, and with our CSA (community-supported agriculture) has been rocking our socks as of late, we've been eating fresh, healthy, and seasonal. Oh it feels so good! 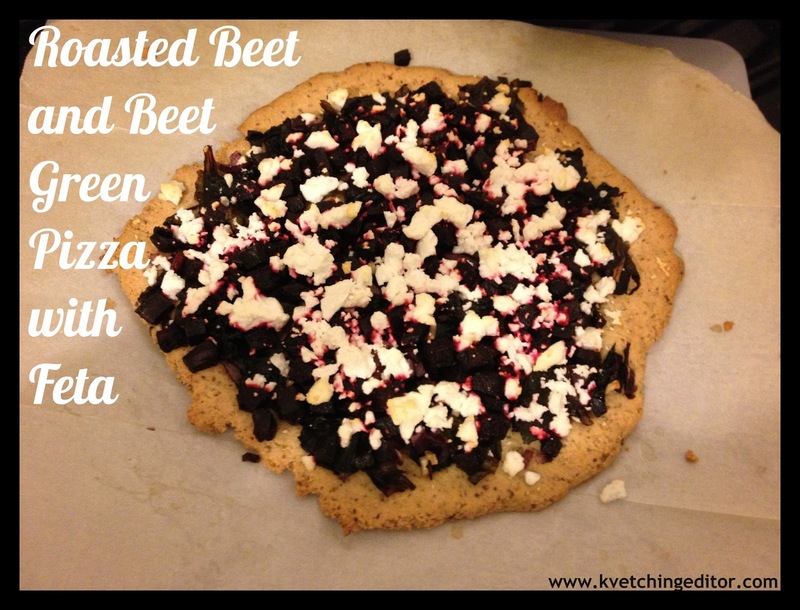 So, I give you, the instructions to make this easy, quick Gluten-Free Roasted Beet and Beet Green Pizza with Feta. Let me know if you try it. Truth be told, the crust could be eaten as a flat bread, or even spread thinner and cooked longer to be an Italian cracker. You'll also notice I use parchment for everything. I like a clean cooking space and not having to scratch food off of my favorite baking sheets. If you have a pizza stone, use it. If you don't, don't. I'm pro-parchment, you should be, too! Yes, this is a popular band known on the hit Nickelodeon cartoon "Doug," but they're also an incredibly messy root vegetable. So put on your rubber gloves, and prepare to wipe down your counter every five seconds so that you don't dye anything red. With roughly a pound of beets (for me this was three medium sized and two very small), peel them and chop them into 1/2-inch pieces. Place in a bowl and toss with a bit of olive oil, salt, and pepper. Throw them onto a parchment-lined baking sheet and bake in a 400-degree oven for about 45 minutes until they're fork tender and aromatic. I decided to go with a mashup of several recipes I found online based on what I had on hand. This crust is shockingly stable, super delicious, and incredibly flavorful. When the ingredients are full combined, throw the dough onto a piece of parchment and flatten out with the palm of your hand (wet your hand to keep it from sticking) to about a 1/2-inch thick or however thick you want it. Place the parchment with the perfectly pizza-shaped (yeah, right!) dough onto a baking sheet (or, if you have a pizza stone, do it all on there) and place in the oven for about 15 minutes until the edges are brown. no soggy gluten-free crust over here! 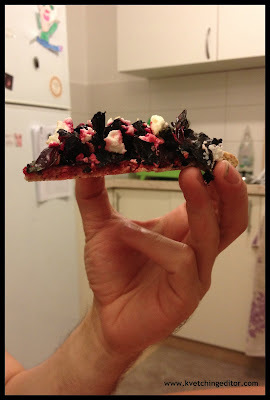 I'm a big fan of using every last bit of produce in my CSA before it rots (so hard sometimes, honestly), so I was happy to make this pizza using every last inch of usable beet goodness. Grab a large saucepan, throw some olive oil in it, and prepare the following. In the saucepan, heat the oil over medium-high heat, and saute the red onion until it starts to brown. Throw in the garlic and cook for another minute. Throw in the beet greens, mix around, and then place a lid on the pan for about 3-5 minutes until the beet greens are slightly wilted but still incredibly colorful. 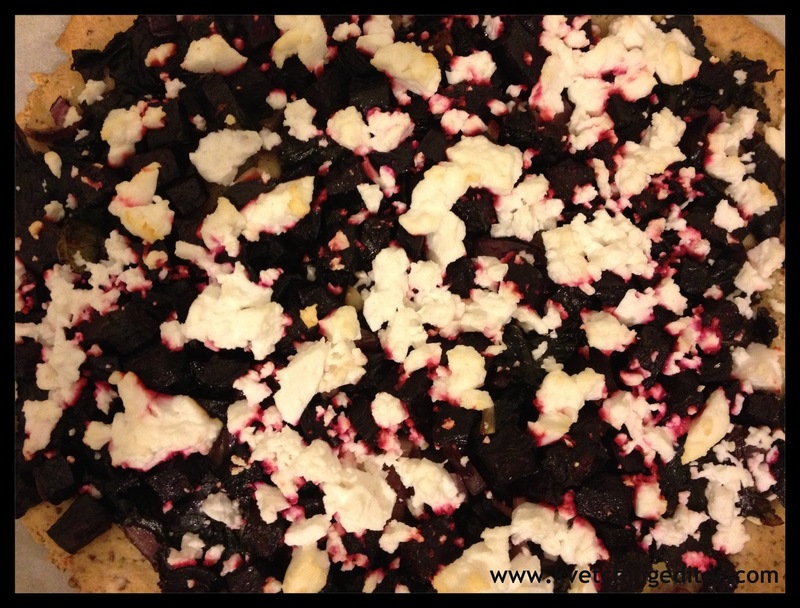 Once the crust is brown around the edges, take it out of the oven and throw on the beet greens/red onion mixture first, then the roasted beet cubes, then top generously with delicious feta cheese. Yes, I took a bunch of Lactaid to be able to consume this pizza, but I guarantee you the beet/feta combo is unforgettable. Place the pizza back in the oven long enough for the feta to get soft and start to brown. Feel free to turn on the broiler to hasten the process. Then? Enjoy! Eat the heck out of this pizza. The great thing about it is that it's incredibly filling, doesn't have the greasy grossness of a lot of regular pizza (2 teaspoons of oil, people), and the nut crust and hearty topppings will leave you feeling satiated but not weighed down. You asked. I answered. Check it out! 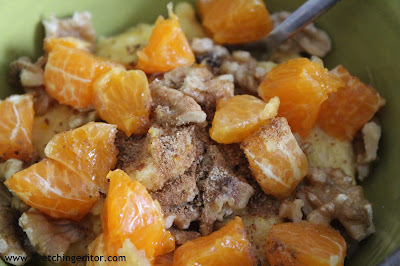 First of all, I have to apologize for the ch-ch-changes going on here on the blog. I wanted something new and fresh to go with my new and fresh existence in Neve Daniel with Mr. T and iBoy, but I'm working out some major kinks. You'll notice that at the bottom of this post from the homepage you won't see any comment link. Nope! You have to click on the title to get into the post and then comment. Argh! Sorry for the frustrating changes, but hopefully I'll get them worked out super stat. You will be happy to note that you can now easily email me through the little GMail envelope link over there on the right. Now on to that delicious dish up there. The amazing bowl was a wedding gift set from the amazing Schleids, and I can't express how much I love them. 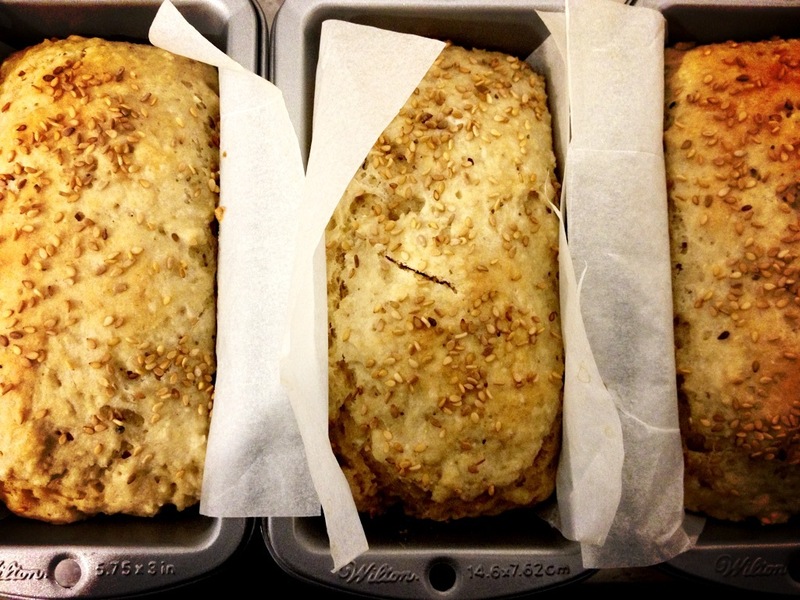 We use them for everything -- prep, eating, serving, you name it. We now need to find more of them because of our intense love of said bowls. 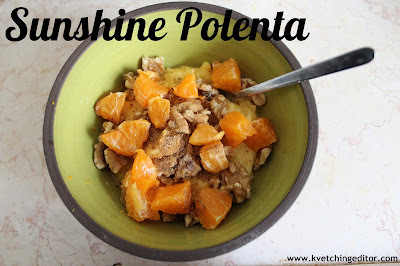 I call this Sunshine Polenta because it'll smack you in the face with freshness and wake you up. There are a lot of ways to make it versatile, but it's gluten free, dairy free, and vegan. feel free to throw on some Greek yogurt or something else to make it your own, but this is how I do it. On the stove, bring 2 cups of any combination of orange juice, almond/rice/coconut milk, and water to a boil. I used a 1 cup almond milk, 2/3 cup OJ, and 1/3 cup water ratio for mine. Once it's boiling, pour in 1/2 cup polenta and stir as the mixture comes back to a boil. Once it's boiling and bubbly in orange deliciousness, let it cook at medium heat for 3-5 minutes. 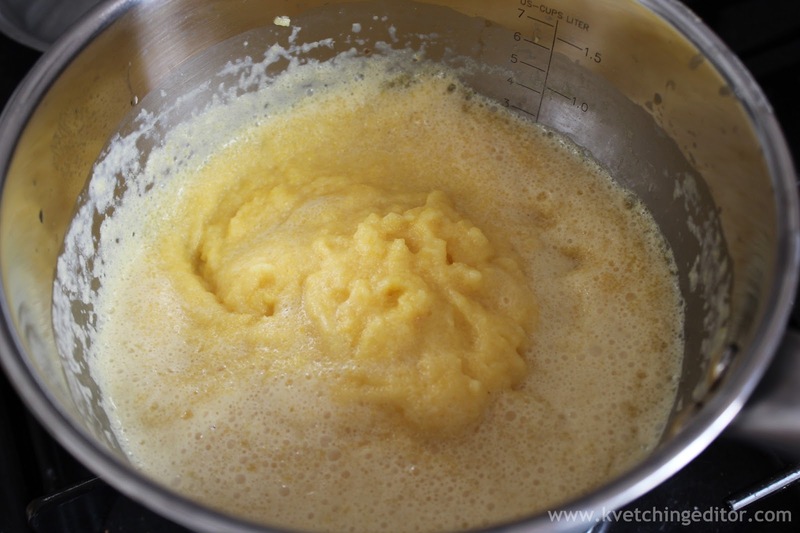 Whisk it good, then take it off the heat, cover, and let it sit for at least 5 minutes. Using an orange or a tangerine, zest the heck out of the polenta until you're heart's content. Slice up pieces of the orange or tangerine and top the polenta (it took about half a tangerine for me). I topped mine with walnuts, flax meal, coriander, cinnamon, and a drizzle of Agave, but feel free to embellish yours with other fresh, healthy toppings. And then? Devour! Devour it like you haven't eaten in days! Oh, and be sure to make yourself a cup of delicious Vanilla-Nut Coffee to go with it. If you don't have Vanilla Nut, any old cuppa Joe will do. We've all seen it. Take three steps forward. Take three steps back. Over Shabbat, Mr. T and I had a series of fascinating discussions about halacha (Jewish law) and minhag (Jewish customs). It was one of those where I lamented not being able to use Google, and Mr. T ran to his seforim (books) and began searching for the answers. The issue at hand? At the beginning of the Amidah (aka Shemonei Esrei aka the central prayers during the morning, afternoon, and evening prayers), we're instructed in most prayer books to take three steps back and then three steps forward before we begin davening. Why? Well, the answer is simply because Rabbi Artscroll tells us to, right? It's just what people do. Everyone does. Right? I was telling Mr. T during dinner about how it drives me nuts in davening when after the Shemonei Esrei when there is no repetition that people take their three steps forward and then do the hop, hop, hop action. Why does it drive me nuts? Because the only reason you're meant to do this is because it's part of the repetition when you say Kadosh, Kadosh, Kadosh and rise on your toes. If you're running behind and miss the repetition, you finish the Shemonei Esrei and then do your three-kadosh hop. But when there's no repetition, there's no need for the three-kadosh hop. Mr. T smiled and quipped that the whole "three steps back" before davening is a minhag, not law, and that you're only meant to do it if there's no space for you to step forward -- the forward steps are necessary, the backward steps are not. What!? Mind blown. So he ran and grabbed his Mishnah Brurah and got searching (because, of course, I didn't believe him). 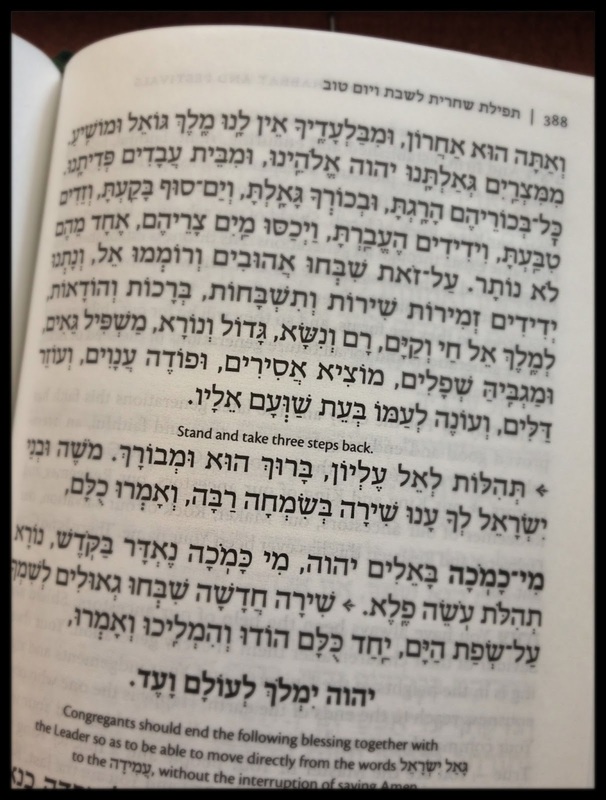 I grabbed all of my siddurim and attempted to find something that says "By the way, this is minhag and you're only supposed to do it if you don't have space!" But I couldn't find a thing. From Rama 95:1, Mishna Brurah 95:3, and Piskei Teshuvot 95:3: You should take three steps forward to show that you're doing an obligatory mitzvah. 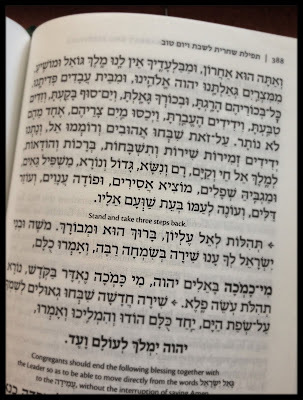 The halacha doesn't require taking three steps backward, but the "Minhag Ha'Olam" is to take three steps back in order to take three steps forward. Mind blown again! 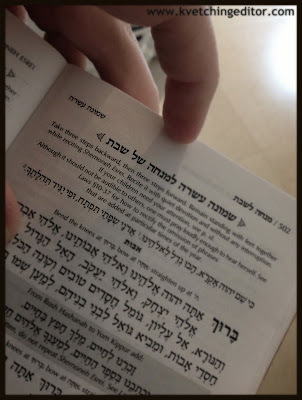 That being said, I'm proud that the nusach with which I'm now davening (it's a little green one from England) only says to take three steps forward -- no backwards steps. Interesting! So why do we all do it? Does anyone even think about it? Did you know that you're not obliged to take three steps back before the Shemonei Esrei? Ask Chaviva Anything: What's the Deal with Minyans? This question on Ask Chaviva Anything! made my heart sing. Why? I love getting questions that are genuine, and this is one of those that is seriously trying to understand a concept in Judaism. So here we go! I saw your tweet about Mr. T helping making minyan at Ikea, and it made me curious. I'm not Jewish myself, and while I'm familiar with the concept of making minyan, it's not something I would have expected at Ikea. Can you tell me a bit more about making minyan and the contexts in which it occurs? Before I answer the question, I have to express to you how amazing Ikea in Israel is. Yes, everyone complains that it's more expensive than in the U.S., and although that is true, it's completely written over by the fact that they have kosher food at Israeli Ikeas! Yes, you can go and get breakfast or lunch or dinner and a coffee and a 2 shekel ice cream cone (alas, they only put it in cones because it comes out of a machine, so no ice cream for this gluten-free foodie), and not worry about anything. It's like ... heaven. Especially as someone who used to go to Ikea and relish in the cheap food there. Being able to get a filet of salmon with two sides and a beverage for 35 shekel is a major shocker, especially because at just about any restaurant in Israel you can't get a salmon dish for even double that amount. Sorry for the tangent, I couldn't help myself. Now, minyan refers to the amount of men over bar mitzvah age required for public prayer in Judaism for the typical morning, afternoon, and evening prayers and a bounty of other public prayers. Although it's permissible to pray alone, there are some medieval commentators (Rashi) who suggest that one is obliged to pray in a minyan of at least 10 men and should travel near and far to seek out a minyan, while others rule that it's okay to pray on your own and not seek out a minyan (Ramban/Nachmanides). The downfall is that we understand that HaShem's presence rests with a group of at least 10 men praying together in a way that it doesn't with the individual who prays alone. 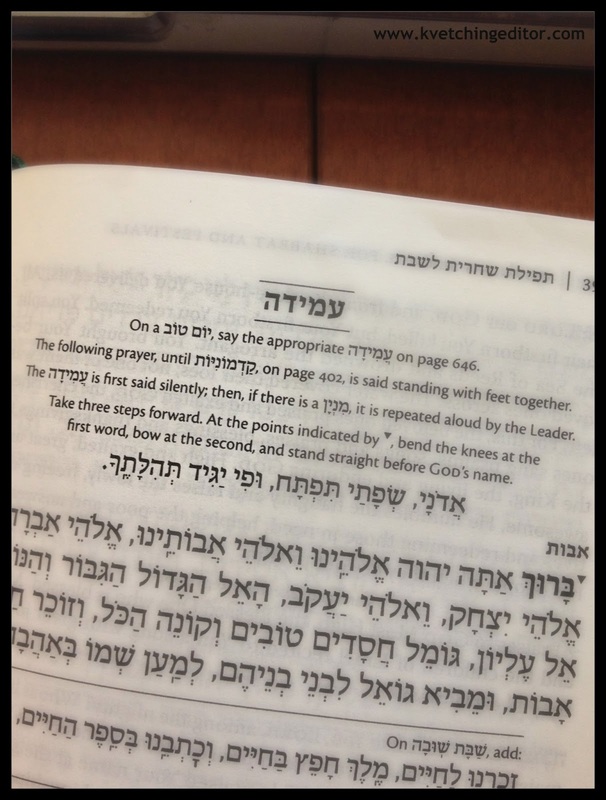 But either way, Judaism praises any individual who manages to pray three times daily. The term minyan comes from the Talmud and its origins are in the Hebrew root mem-nun-hey (מנה) meaning to count or number. It's also related to the Aramaic word mene, meaning numbered, which appears in Daniel 5:25. The way that the Talmud (the Oral Torah) -- both the Babylonian (Bavli) and Jerusalem (Yerushalmi) -- arrive here in basically the same way based on a concept called gezarah shavah, meaning that if it's said here, then it's also said the same over there. We start with Leviticus 22:32, which uses the word "midst" in the following way: "And I shall be sanctified in the midst of the children of Israel." Then comes the word midst in Numbers 16:21: "Separate yourselves from the midst of the congregation." Lastly, the term "congregation" appears in a verse about the 10 spies that returned to give a negative report of Israel in Numbers 14:27: "How long shall I bear with this evil congregation which murmur against me?" Bam! The conclusion here is that a congregation of HaShem comprises 10 men. The Yerushalmi arrives there in a similar way, but with a bit more of a connection to Jacob's ten sons. When do you need a minyan? Basically any time that the Torah is being read publicly, any time you need to say Kaddish (the prayer for the deceased), at a wedding, and any time that you are going through the morning, afternoon, and evening prayers (among a slew of other times, really). In Judaism, when in doubt, you need a minyan to say anything that puts you publicly with the congregation of HaShem. There are loads of "cheats" involved in the minyan, like if you live in a secluded area and only have nine men plus a boy under bar mitzvah age, but an entire book could be written about the history of when 10 wasn't doable and what we used to do in times of crisis when finding 10 men required loss of life and limb. Does this help answer the question? There are dozens of amazing questions sitting in the Ask Chaviva Anything! queue, and I'm chomping at the bit to answer them all -- including some of the nastier ones! Oh wait, no I'm not. Listen, to whoever keeps posting questions about how miserable I must be making Mr. T's life, you're living in a dream world. We're genuinely happy, and if my word isn't good enough, then I don't know what to tell you. Now, this is a question I received that I wanted to address because it's actually pretty timely with Passover coming up. Any advice for a non-Jewish mom sending her kiddo to a Jewish preschool? I will be sending him with a packed lunch every day. I don't want to offend or break rules; I do want him to feel happy about his lunch. 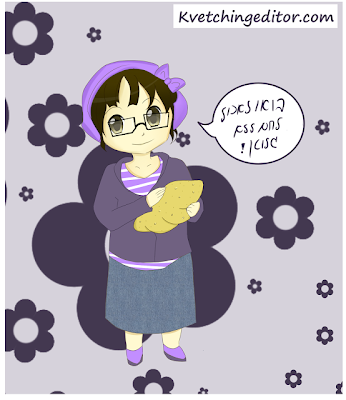 (The school statement is that they are not strict, but ask that we send a kosher lunch and non-leavened bread at certain times.) On the tour lunch was a big point, and the word "compliance" was used. Yikes! I don't know what I am doing. How utterly exciting that you've got a little one heading off to preschool! When I was living in Colorado, the Jewish preschools there are some of the most highly rated and populated in the state because of the quality of education, and most of the student population believe it or not was not Jewish. The schools run on Jewish values and promote an understanding of the Jewish holidays and customs, but with a diverse population base, the goal is creating well-rounded participants of society. So to you I say kol hakavod! Way to be. Now, as long as you follow the guidelines dished out by the school, you'll be fine. My advice is to find another parent at the school who you click with and bounce any questions or concerns you have off of them if you're not comfortable going to the school's administration. Chances are, as long as you stay in the realm of "kosher style" -- that is, no pork or shellfish (how often are you sending shrimp cocktail with a preschooler anyway, right?) and no sandwiches that mix meat and milk -- then you should be fine. I'd suggest sticking to classic cheese sandwiches, yogurt, PB&J, doing vegetable sticks with hummus or peanut butter, chips, crackers, fruit, granola bars, and so on, avoiding meat all together in the lunchbox. It'll make your life a lot easier. 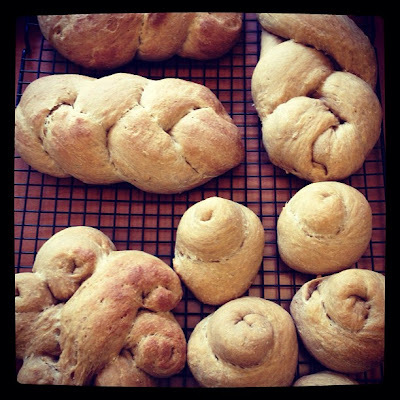 As for the non-leavened bread, that means that in a few weeks when Passover starts, do your best to send anything and everything but sandwiches. 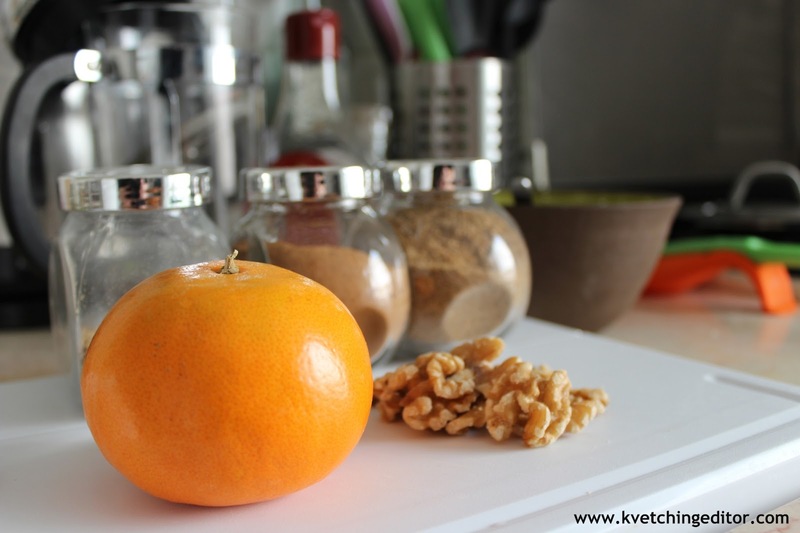 Consider rice or quinoa salad, lots of vegetables and fruits and nuts, take it as a chance to give the gluten-free or paleo diet a try for a week with your child, to branch out with the lunchbox experience (hey, maybe a great blog idea!). Send them to school with buckwheat pancakes and yogurt, some flavorful and yummy waffles, or Nut Crisp crackers and a bounty of veggie sticks with tuna or PB or hummus. I hope this helps! I get to experience the lunch-packing thing now with iBoy, which has been a fun challenge because of what he will and won't eat and making sure he has shelf-stable food that will get him through lunch time and beyond. 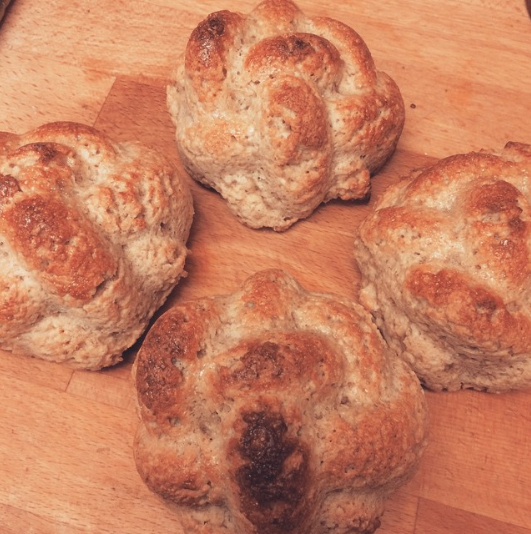 I made gluten-filled challah for the first time in exactly 1.5 years. Mr. T and iBoy got to take part, and I heard it was delish. Oh, and it also was the first time I was able to say the bracha. Winning! Hello faithful blog readers. Yes, I've been neglectful -- horribly neglectful. What happened? What have I been doing? How is married life? 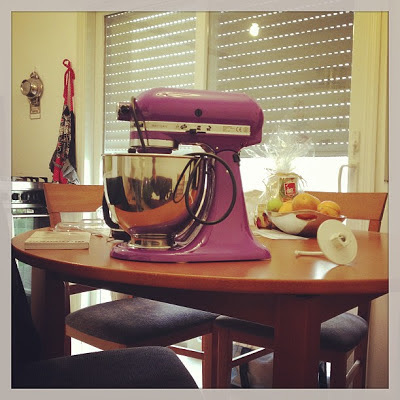 How is ulpan and work? How is Israel? Am I still sane? So very many questions, so little time. I have some announcements to make about some executive decisions I've made, some fun quips about being married, and some hilarious tales about the goings on with bureaucracy (I am now the "mayor" of the Ministry of the Interior in Jerusalem, if that tells you anything). But for now, I'm going to give you a collage of the various head coverings over the past several weeks. 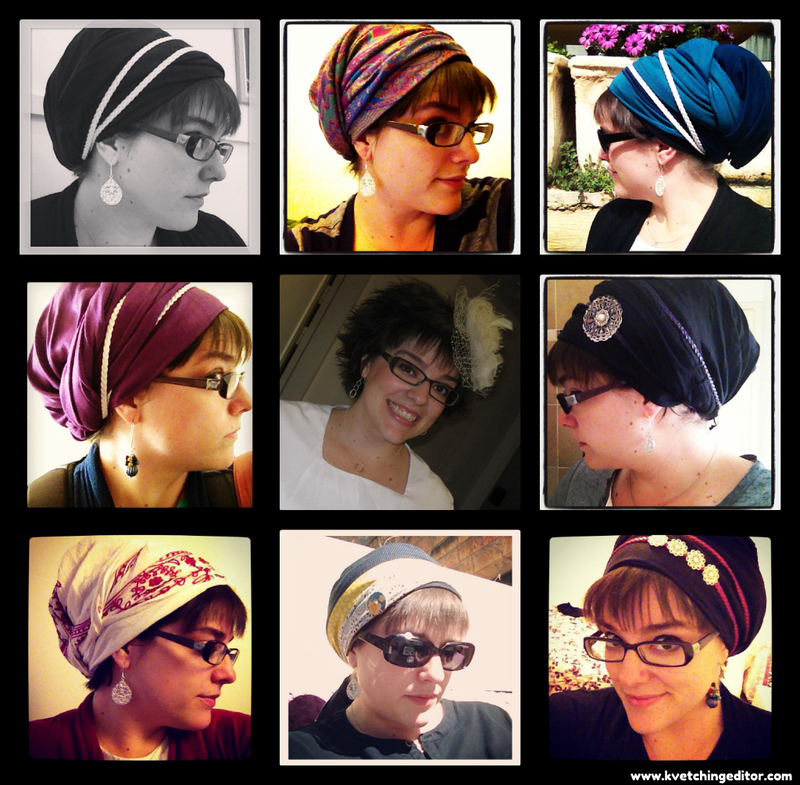 I'm going to work on a few videos and some tutorials on how I rock my scarves because I've had requests. For those that are curious this very second -- no, I don't watch other videos or read books on how to tie my scarves, I just do it naturally. How? Why? It's the neshama, folks. It was born to love gefilte fish and wrap mitpachot, what can I tell you? So stay tuned. I promise a post in the next few days. Also? More wedding pictures because we just got the gigantic load of photos from the wedding from our amazing photographer Shmuel Diamond. Want to know something? Demanding answers about what's going on with me? Just ask! From the most amazing mum-in-law in the world. Now to find, purchase, and acquire the grain mill attachment. Soon, all will be right in my gluten-free world!